On Saturday, July 7th at 2pm the Cahir Half Marathon and Team Relay will once again take a picturesque tour of 13.1 miles of the delights of Cahir town and the surrounding countryside in Co. Tipperary. In the fourth year of the event, Mooreabbey Milers A.C. are delighted to welcome you to this historical town. The ever popular Half Marathon event is on the same lovely route as last year. A lovely flat course with an overall height gain of only 70 metres. It is the perfect course for your first half marathon or for those seasoned runners who are looking to get a new PB. It is also a perfect race for those training for any marathons in Autumn 2018. For the second year running, we will again have the extremely popular Relay event. This proved to be a huge hit last year! Two team mates each run 6.5 miles, with the clock ticking it will be a joint effort to get their best possible time. The course is accurately measured, has an AAI permit and the race will be chip timed. 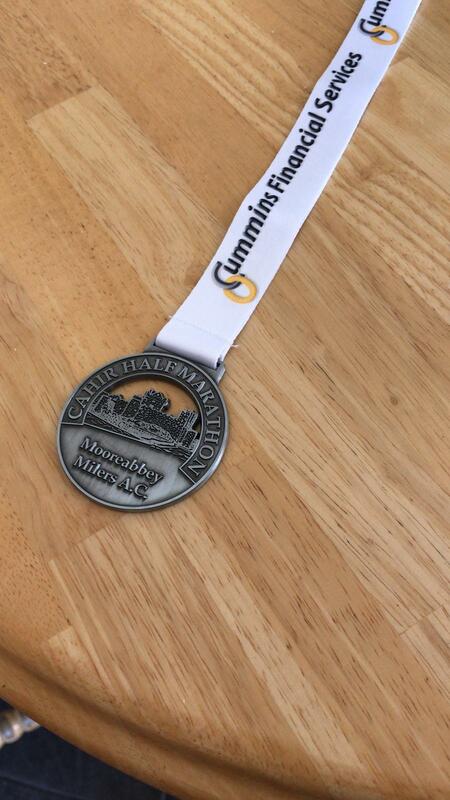 For your efforts, you will receive a bespoke Cahir Half Marathon and Relay medal, a fashionable and practical buff and a substantial goodie bag as well as refreshments and physio's on hand at the finish area. There will be very generous cash prizes for the top three men and women as well as category prizes. Furthermore there will be a few spot prizes thrown in! Entry fee is €30 per individual or €40 per team of two for the Relay. Closing date for entries at the current prices is Sunday 24th June, after this date the entry fees will increase so make sure to register in time! Final closing date will be Saturday, 30th June. You will not be able to enter on the day.